I can’t even believe this is finally happening! 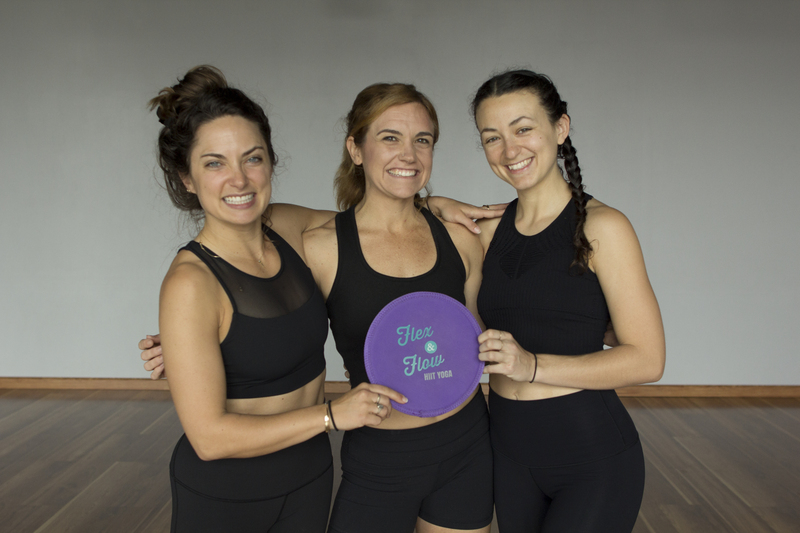 After more than 4 years of hard work and even harder workouts, I’m proud to announce that I will be hosting our first ever Flex & Flow HIIT Yoga Teacher Training with my two amazing FFY HIIT Yoga Master instructors (and wonderful, sweaty friends), Liz Wilson and Nicci Randall. I initially designed the HIIT Yoga workout for myself. I was living in San Francisco, doing a very San Francisco thing (duh – a startup), and working very long hours which meant I was pressed for tine when it came to working out. I was craving the sweat, challenge and endorphin rush that I would get from climbing a mountain or going to a hot, sweaty power yoga class and wanted an efficient workout that would help me stay fit for running while also keeping me bendy and flexible. One evening while working late at the office, I decided to retreat to our lounge for a much needed break. I felt tired, stressed and puffy. I wanted to sweat. No. I needed to sweat. 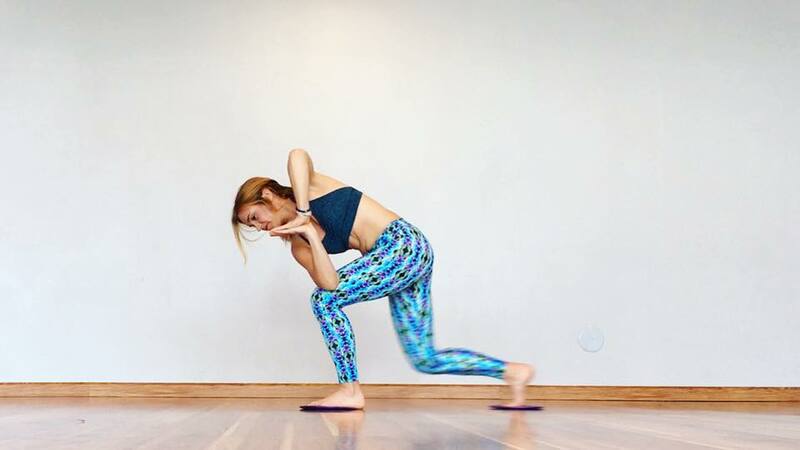 I started playing around with some movements that I would frequently use in bootcamp classes and combined them with some of my favorite yoga poses. And the more I played, the more I fell in love. I was energized, challenged, sweaty as all hell, and my legs, core, and upper body were on fire in the best way possible. I started doing the workout a few times a week – just building on the movements – feeling stronger and less puffy with each workout. Pretty soon, FFY HIIT Yoga became an integral part of my week. It became an escape from the long hours and stress of startup life and helped me get back into trail running and yoga shape. I began talking about it to my fellow runners, friends, and bootcamp clients and they all wanted in on it. Everyone wanted to try the workout that had me literally buzzing with energy and feeling stronger than I ever had before. I first brought FFY HIIT Yoga (under the guise of Glider Yoga) to a San Francisco yoga studio where I taught a couple times a week and asked the owner to allow me to rent space so I could begin hosting classes. Once I had the space secured, I invited friends, fellow runners, and bootcamp clients to join me in the sweaty weeknight fun. And after a few months of trial workouts, and finessing my classes and sequences, I realized I was truly on to something – not only because clients were returning week after week and the studio was practically bursting at the seams – but also because people were telling me how it was improving their strength, flexibility, mobility and performance in their various sports. Not to mention, giving them more energy and helping them look and feel their best. But this was merely the beginning. 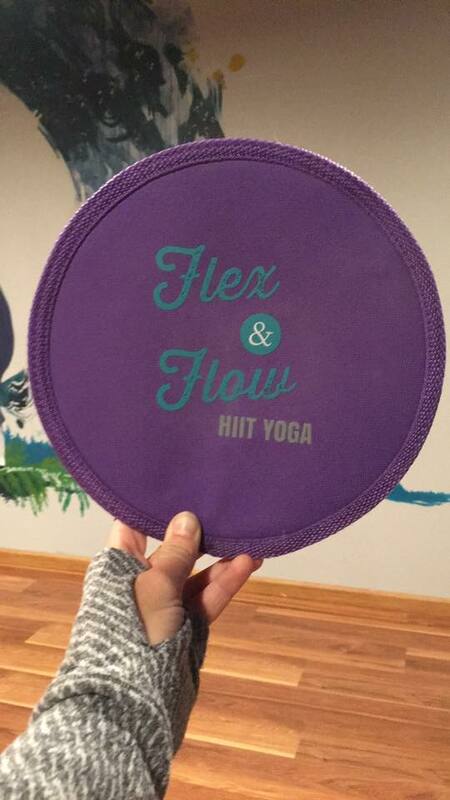 Bringing FFY HIIT Yoga to life. 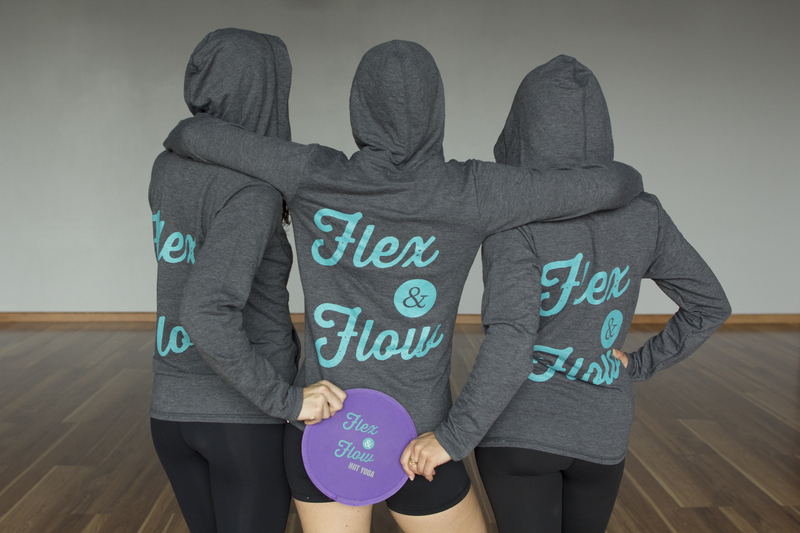 I was getting ready to open Flex & Flow, a yoga and fitness studio in Portland, OR (oh yeah, I moved…), and talking up the workout with two of my instructors (Liz and Nicci) eager to get them involved. Eager to get them teaching. They were a little skeptical at first. But the more we worked on it together, the more the sweat-spiration flowed. The more we all fell in love. And when Flex & Flow’s doors opened, I spent early morning after early morning, practicing and sequencing, and eventually bringing the sweat and challenge to my wonderful Portland community. And slowly but surely that persistence paid off. It started to catch on. Students started coming in to give it a try and then I’d see this spark in their eye and they started returning week after week. And I knew that they too were hooked on the rush, the sweat, the challenge and of course, the laughter. 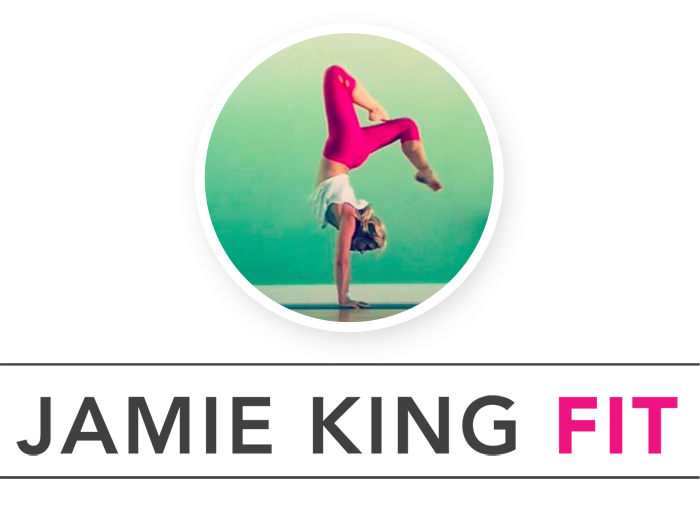 Become a FFY HIIT Yoga Instructor! And now I’m excited to share this sweaty, challenging and community building workout with the world. Whether or not you’re joining us for the sweatiest and most fun weekend in April for our first ever FFY HIIT Yoga Teacher Training, make sure you SUBSCRIBE to our newsletter to get updates on classes, upcoming trainings and more! And if you want to get in on the sweat but can’t make it in for class, grab some FFY HIIT Yoga gliders and follow along on my YouTube channel for workout inspiration! If you are joining us next week, get ready for all the sweat, education AND awesome swag from sponsors like Naked Nutrition, Purely Elizabeth, KIND Snacks, Kodiak Cakes, lucy, and prAna. Hope to see you HIIT it with us on the mat soon! PS – If you’re still on the fence, but find yourself wishing you could do something like a teacher training, I say STOP wishing and start doing! Use the code LASTCHANCEFFY for 15% off next week’s HIIT Yoga Teacher Training (Expires Friday 4/28). Shhhhh…..#yourewelcome. Five Things Friday: let's HIIT it y'all! I’m so proud of you and so excited to see the FFY HIIT Yoga community grow. This is such a booty kicking workout – I loved getting to be part of the early days and also to see it continue to evolve and turn into the powerhouse of a workout that it is. Well, it’s YOUR super duper sweaty baby too. Plus, I read that you really like sweaty sleepy headed babies. 🙂 This one isn’t as cute as yours but she sure does make me SWEAT! Congrats Jamie!!! You must be so happy to see this come to life. I definitely want to try one of these classes! !